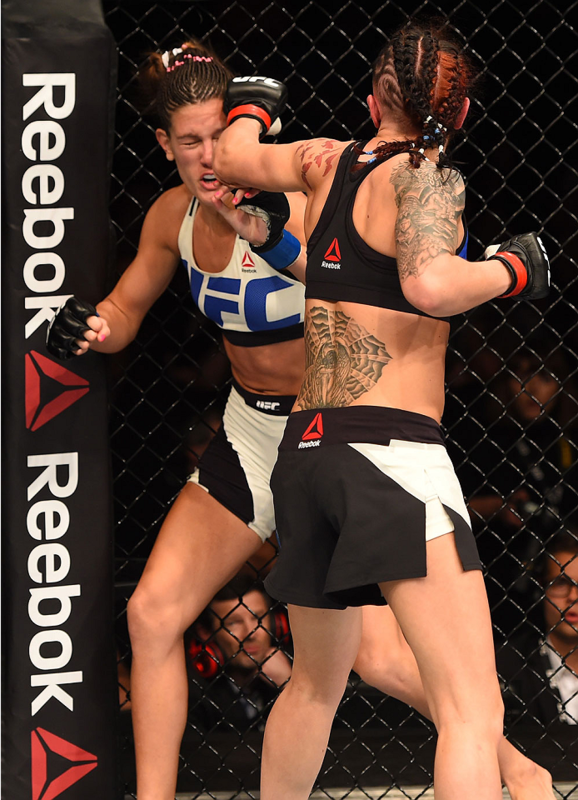 Cortney Casey’s footwork is a big issue. In mixed martial arts, footwork isn’t a strength in any division -- male or female -- but for Casey, footwork is an especially big concern that affects her negatively on the offensive and defensive ends. Offensively, Casey would like to be able to pressure her opponents, forcing them to have to fire off to give her something to counter. However, due to her inability to consistently use angles or vary her steps and rhythm, Casey is unable to threaten or create a sense of dread. She is unable to pressure; instead she often comes up short or is outpositioned due to her inability to work her way into the pocket, where she does her best work. All of these things have happened in her bouts against Ham, Calderwood, Gadelha, and Felice Herrig. Defensively, Casey has similar flaws as she does offensively. She often travels on straight lines, which can be effective, albeit predictable, offensively, but defensively it is a liability because most fighters can move forward faster than fighters can back up. This ends up with Casey getting caught clean when trying to escape volume or pressure, when opponents feint their way in, or when she is exiting the pocket. Casey would like to bait opponents into coming forward in order to set them up for counters, but her inability to exit on angles or circle out under any sort of duress constantly gets her caught on her heels or trapped on the cage like she was against Gadelha, Calderwood, and Herrig. Cortney Casey is one of the elite athletes in the division. The former Division I soccer player is big, strong, long, and explosive. She is also a fighter who has a strong grappling base, showing acumen both in working from the guard chaining submissions and hitting sweeps to transition into hitting submissions or scoring heavily with ground and pound. Given this knowledge and considering her lack of seasoning on the feet, you would think Casey would be much more determined to dictate where fights happen and how they get there. However, Casey, for all her size, athleticism, and grappling skills, is tremendously ineffective and inefficient in regard to taking opponents down. She has shown some skill working from the clinch and hitting trips to get opponents down, but she is far from a sure thing, as she struggles to get clean entries to get into a position to attempt takedowns. Worse yet, her poor footwork limits her ability to stay in these positions or dictate terms of engagement to get takedowns, as she lets opponents angle out and counter her aggression. Or they get into clinches with her, tying her up, turning her, and putting her on the defensive, and eventually on the cage, on the way to being taken down. This has been the case in some form or fashion against Calderwood, Herrig, and Gadelha. Defensively, Casey seemingly lacks the footwork to maintain distance or stay off of the cage, which allows opponents to get their hands on her and get clean takedowns in advantageous positions that can limit her ability to finish with submissions. This happened against Gadelha and Calderwood repeatedly. When Casey was taken down in the middle of the cage she was able to sweep and/or finish against Herrig and Randa Markos, but the fact remains that she was easily taken down. Casey’s inability to dictate when and where a fight goes, much less how it gets there, further exposes her limited and predictable striking offense, as the lack of a takedown threat leaves her opponent free to focus on the threat (or lack thereof) she presents on the feet. The threat of wrestling can act as a line of defense and a way to create openings for offense. In fights against the aforementioned fighters, her inability to mix things up limited her ability to open up or take chances, and allowed them to find holes in her standup because she didn’t have the takedowns or takedown attempts to ward off volume or pressure. 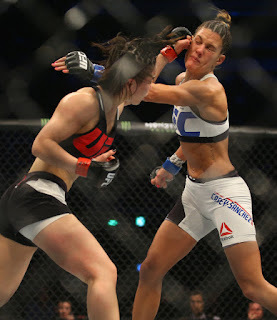 Cortney Casey is an effective counter-puncher; she has the character that leans towards that style and has the explosiveness, reach, and power to make opponents pay a high price for attempting to land big shots, much less volume on her. The problem comes when an opponent forces her to move forward -- she gets blasted, because she lacks the footwork to navigate distance or to get in position/range to land consistently. Nor is her footwork good enough to create enough of a threat to bait opponents into giving her something to counter. So when she moves forward, Casey either walks into shots or she gets pushed back through volume and variety (vs Herrig), pressure (vs Calderwood and Ham), or explosiveness on offense (vs Gadelha). Casey doesn’t have the feints, the footwork, the positioning, the volume, the creativity, or the activity to lead effectively and efficiently. Casey’s problem is multifaceted. Her footwork, timing, and positioning isn’t good enough for her to sit back and counter consistently unless her opponent is coming straight in or over-pursuing, so even in her strong suit she can be had with feints, footwork, and creative strikes/combinations. This forces her to take the initiative, where she pays a price because of shortcomings in offensive techniques, strategies, and awareness, which limit her ability to pressure and close distance so that she can establish herself offensively. And once her forward progress has been stopped or disrupted, then she gets forced into the counter role, where her previously mentioned holes get exposed. Casey hasn’t shown the character to consistently work in a fight. When facing an opponent who poses a threat, Casey is often unwilling to generate any consistent offense. Part of it is due to the lack of depth to her game, i.e. her limited shot selection, footwork, positioning, and defense. Another part of it is the complete lack of skill in certain areas, i.e. her negligible offense and defensive wrestling. But the large part of it is a) her character -- she is a counter-fighter by nature and has a problem initiating or maintaining offense, and b) when she does fight it’s often in big bursts, both in regard to the amount of activity and the explosiveness of the activity, which results in her often having lulls as she recovers and resets for her next big burst. In fights against Calderwood, Herrig, and Gadelha (her best opponents), large portions of the fight consisted of her waiting to counter or being inactive as she covered or retreated. It doesn’t help that her offense is so heavily built around her right hand, as she really lacks the diversity to put together an efficient and consistent offensive attack. Like most athletically gifted fighters, Casey has been able to progress into this level of mixed martial arts in large part due to her size, length, explosiveness, and power much more so than a fully developed skill set. Much like a Jessica Andrade or a Paige VanZant, the athletic tools provide a margin for error, which limits the negative effect of technical holes and maximizes the impact of the things said fighter does well. 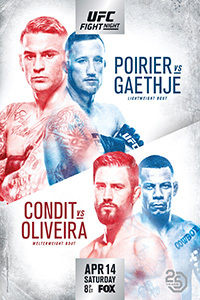 Unfortunately for all three fighters, seasoning and experience count, and when opponents are able to navigate the athleticism and extend a fight -- or even worse, counter it, putting them in positions or circumstances they normally aren’t placed in or stuck in -- that is when poise, ability to adjust, and decision-making becomes highlighted. Cortney Casey has routinely made wrong decisions and cost herself wins as a result. Against Calderwood she essentially backed straight up and circled around the cage, repeatedly getting stuck on the fence and beaten up there, or being taken down off the fence and trying ridiculous submissions, which resulted in her being put on her back and worked over. Cynthia Calvillo, by comparison, baited Calderwood when they fought, pot-shotting with kicks, punches, and reactive takedowns (or takedown attempts). 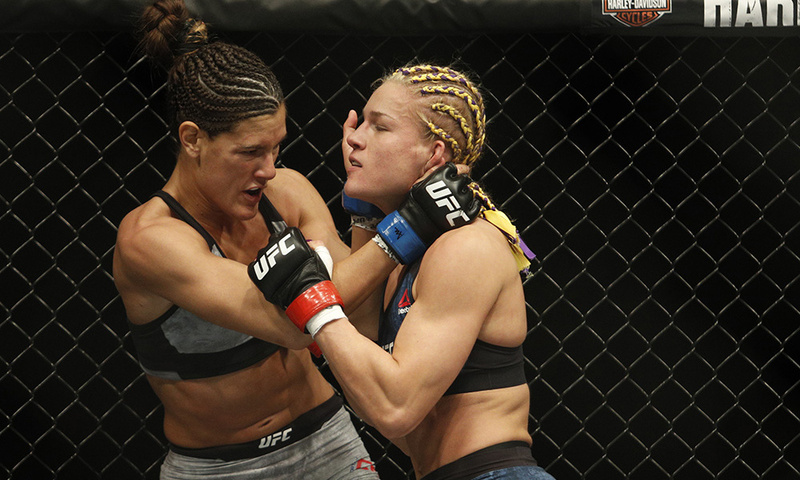 Against Herrig, she essentially lowered her volume both in initiating offense and countering it, as she allowed Herrig to pick away at her with jabs, hooks, and leg kicks while she waited for the right shot. What’s worse is that she allowed herself to be pressured to the fence with strikes and feints, and pushed to the fence off of takedown attempts. VanZant and Karolina Kowalkiewicz just applied pressure, threw volume, and walked into clinches to wear down and eventually wear out Herrig. In in her fight with Gadelha, she was competitive early, but she gave up takedowns. And instead of creating scrambles or getting back up, which would have exposed a fighter with a history of a poor cardio, she sought to work off her back, hunting for submissions (as she did versus Calderwood) against one of the finest all-around grapplers in any women’s division. In multiple fights, once things started going bad, Casey was never able to get them on track, not because she lacked skill, but because she couldn’t correctly assess the circumstances, meaning that she couldn’t respond in the appropriate manner. This Saturday night at UFC on FOX 29, Cortney Casey has another chance to fight a "name" opponent, having gone 1-3 against the most established and accomplished opponents she has faced. As always, Casey will have the physical tools necessary to keep her in the fight and enough technical skills to win it. The question for her fight with Michelle Waterson is, will she put together a consistent performance from round one to three -- can she make the right decision when her opponent makes an adjustment, can she turn a fight around once she starts losing, will she show enough development and be able to bring it to bear when it counts? Casey either takes a step forward, showing newfound awareness, skills, poise, and technical progression, showing that she may be able to make good on the promise her physical tools and performances outside of the UFC suggested. 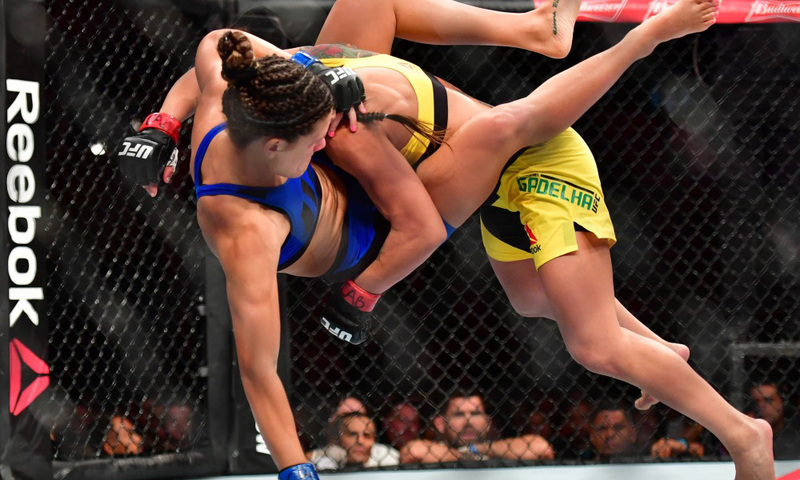 But if it's the same old Casey doing the same old things, we may have very well already seen the best that Cortney Casey has to offer, and it is not good enough to be elite status or championship caliber.